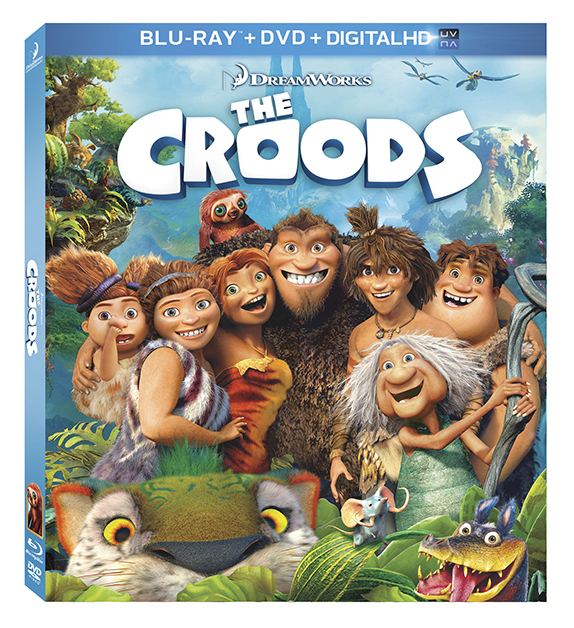 The Croods Movie Comes to DVD/BluRay Combo Pack on October 1st! In March, my family watched The Croods film in the movie theatre and we all loved it! You can read my movie review of The Croods here. The Croods is about a family of cavemen, that live holed up in a cave for the sake of survival. However, teenager Eep wants to see more of the outside world, and this is a recipe for disaster in prehistoric times. The Croods is about family bonds, home, survival and new love. Although the movie title might lead you to believe that it's crude, it was actually a very clean family comedy. And it was so hysterical, it had the adults in the audience really cracking up! That's why I'm looking forward to owning The Croods when it comes to DVD/Blu-Ray combo pack on October 1st, 2013! 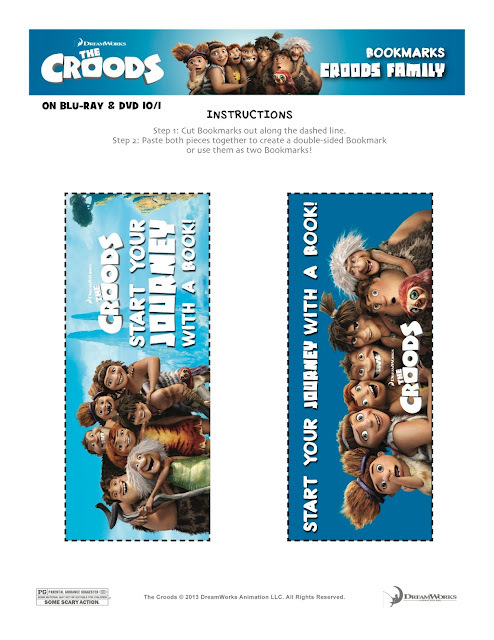 See below for some great The Croods kid's activities! 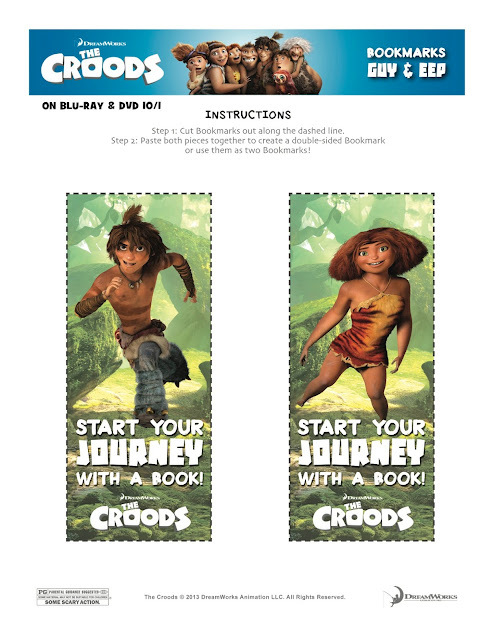 Click on The Croods images below to supersize them and print out The Croods bookmarks from your home printer! Click Image to Supersize & Print! 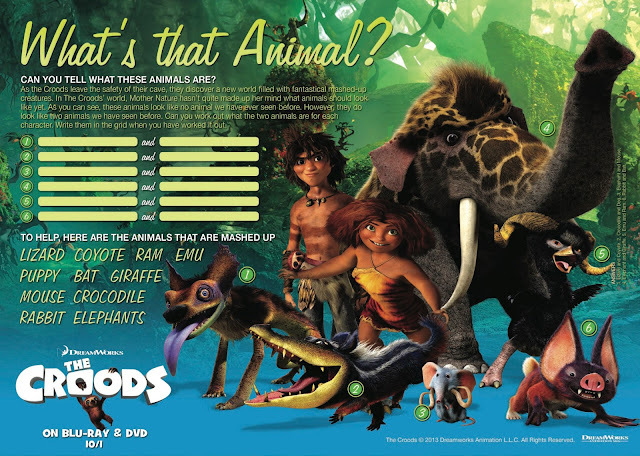 The Croods: What's That Animal Quiz! Look at the prehistoric animals in the puzzle and try to find out their modern-day equivalent! Click on the image below to supersize it, and print it out from your home printer! The Croods comes to DVD/Blu-Ray combo pack on October 1st, 2013! Get your copy in stores everywhere on that date! WIN a copy of The Croods movie on DVD/Blu-Ray combo pack AND a small stuffed animal of the "Belt" character! NOTE: Prize will be packaged differently than shown, and stuffed animal will NOT be packaged inside movie. Open to Canada and the USA. Ends Monday October 7th, 2013! Leave a COMMENT below stating what is the most interesting thing about the prehistoric period (ie: dinosaurs, cavemen, volcanoes, etc), and then enter using the entry form below. GOOD LUCK! I think the most interesting thing about the prehistoric period is how different the weather and climate was. The best part about the prehistoric period would have to be the dinosaurs. The best part about that era would have to have been the dinosaurs ... Jurassic Park in full effect =). Dinosaurs for sure -- they are so fascinating! I have to go with the dinosaurs, I find them all so fascinating and it's interesting that they were so large. I have to go with the dinosaurs, I find them fascinating. Dinosaurs were awesomely huge ! Most interesting thing to me is the different creatures that existed - amazing! My PromoSimple name is Julie G.
I think the dinosaurs are so interesting. I am amazed by Dinosaurs, and often think a lot about how crazy that they existed once. I have to say dinosaurs. I've been to the museum of natural history and the dinosaur exhibit there is awesome! Dinosaurs of course, though before them bugs grew to enormous sizes - dragonflies with 26" wingspans! the amazing size of a lot of the dinosaurs and quite often the ferociousness of them. I wouldn't like to run into one in the forest today that's for sure. I think the most interesting part was communication (or lack thereof) and all the hieroglyphics (sp). I think the communication (or lack thereof) and all the hieroglyphics are very interesting to me. How did they get through the day? For me it's always been about the dinosaurs and how they lived. For me it has always been about the dinosaurs and how they lived. the most interesting thing about the prehistoric period is definitely seeing the "prehistoric versions" of nowdays animals! Dinosaurs are very interesting for sure! I like cavemen and the drawings that they left depicting life at that time. Most interesting part of prehistoric period were the cavemen/people! I'm fascinated that Dinosaurs ever existed. That would have been scary! It is all fascinating but I am especially fascinated by dinosaurs. You know, every boy goes through a phase where the dinosaurs are the coolest thing that ever existed. what i like the most is dinosaurs and cavemens. so fascinating. I think the most interesting part of the prehistoric period is the dinosaurs.. I think it's the whole concept of the Ice age. I find the animals that existed at that time to be very interesting. I would have to say dinosaurs. Thank you! Dinosaurs would be my choice. I think cavemen and the people of that period are fascinating because they survived without any of the luxuries that we consider necessities. In my opinion, the most interesting thing about the prehistoric period were cavemen. They certainly had great survival instincts. I wonder how many people today could manage living back then, given how rudimentary things were in that time period. I am guessing not many.